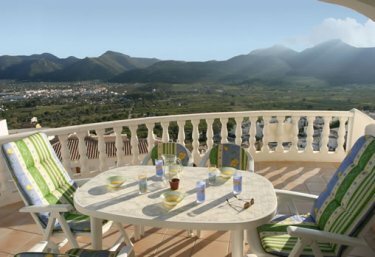 This is a luxury, south-facing villa with its own private pool, located in the beautiful, peaceful area of Valle Del Paraiso and within walking distance of the picturesque market village of Jalon, with its excellent array of restaurants, friendly local bars, shops and other amenities. Relax and soak up the rays on the secluded sun terraces, whilst enjoying the stunning views over the breathtaking Jalon Valley. The golden, blue flag beaches at Calpe are only a 15-20 minute drive away (15Km). Moraira, Denia and Javea are all easily accessible and it takes just 35 minutes to reach lively Benidorm, with its many attractions. There are many attractions in the area such as: many golf clubs, tennis, horse riding, hiking, cycling, sightseeing, safari parks, quad biking, snorkeling, blue flag beaches, water park (Aqualandia), theme park (Terra Mitica), Benidorm Palace, and many more. Our changeover days are flexible all year round. Arrival time 4pm, this can be earlier by arrangement. Departure time 10am, we do our best to accommodate late checkout times but this may not be possible if another client is immediately following you. A cot and high chair are available as an optional extra at �15 per week these need to be pre-booked. Sorry linen for the cot is not provided. A courtesy set of RH golf clubs are available for your enjoyment. Many films (over 150) and board games are available, just in case it rains! (Cards, Jenga, Kerplunk, Frustration, Boggle, Chess, Chequers, Backgammon, Battleships, Connect 4, and more). 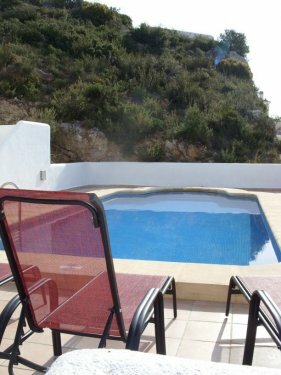 The villa may not be suitable for people with walking difficulties due to the steps leading up to the villa. 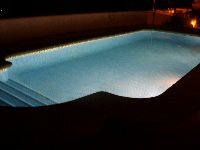 Private 8 x 4 metre swimming pool with roman steps going from 1-2 meters in depth. There is a gate on the upper terrace designed to stop young children going down to the pool area, there is also a gate on the pool area again designed to stop young children leaving the villa premises. 6 sun loungers, 2 recliner patio chairs and 6 patio chairs. Upper main house level - open and shaded terraces. Lower pool level - open and shaded terraces. Built in stone multi-level BBQ on upper terrace. Within a 20 minute drive there are many excellent beaches, some of them holding the blue flag accreditation. Within the villa there are maps showing these and what they are good for, like swimming and snorkeling. There are various local golf courses in the area of different standards from a short 9 hole at Ifac to various challenging 18 hole courses like La Sella, Javea, Oliva Nova and many more. 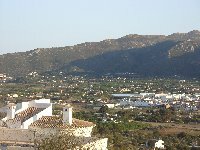 Walking, cycling and climbing is very popular within the Jalon Valley area. Alicante Airport 65-70 minutes away. Valencia Airport 75 minutes away. Car hire is essential (we can provide many links to companies we have used). 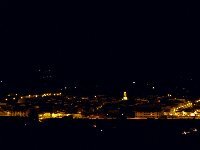 It is less than a 2 minute drive or 15 minute walk to Jalon town. There are many surrounding villages within a 5-15 minute drive. All these offer a good selection of restaurants. Benissa is about 10 minutes away. Calpe is 15-20 minutes away. 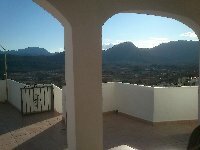 Javea is about 25 minutes away. Denia is about 25 minutes away. Benidorm is about 35-40 minutes away. Alicante is about 65 minutes away. Valencia is about 70 minutes away. A booking form will be emailed to you with your and our details on and includes the terms and conditions of rental. We kindly ask you to check these details and fill in any missing blanks. If all is ok please sign it and return it to us with a �150 deposit (cheque/bank transfer/paypal), which secures your booking. We will then also sign the form and send you a copy back. The remaining balance is due 8 weeks before departure. A �200 refundable breakages deposit will be added to you booking. The prices are based on the number of people in brackets. Where it applies extra people are charged at �25 per person per week. A discount will be given if your party numbers are less than those listed below.